An MC Escher? A Rolling Ball Sculpture? MC Escher was an artist born in the Netherlands in 1898. He died in 1972. His graphic skill and imagination is still unmatched today. Although it is flattering when people compare Perplexus to Escher's work, there are some real differences. Escher creates illusions. His work is about defying gravity and physics. Perplexus is wholly physical, with no spatial tricks, and works because of gravity and physics. Interestingly, Escher’s Relativity, above, could function as a Perplexus, though many of his illusions could not. Why? Because this piece has a natural interconnection of planes in space. If a ball is introduced, and the scene is rotated, it could traverse all planes. 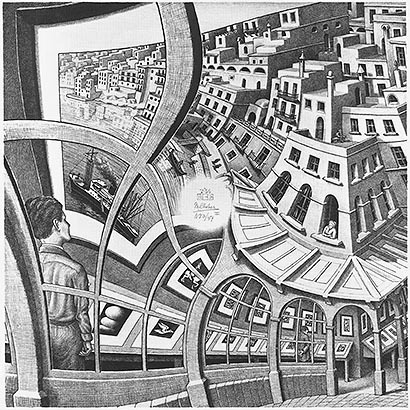 On the other hand, Escher's PRINT GALLERY, above, could not be made into a Perplexus because the planes are illusory. They do not naturally relate physically. 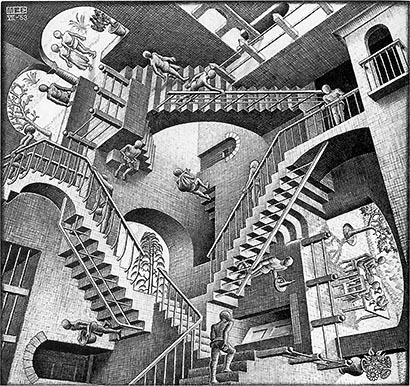 This piece is one of the more obvious Escher distortions. Many of his works have incredible subtlety, where the illusion is difficult to detect at first. Rolling ball sculptures are quite fun to watch. Sometimes they are designed to allow viewers to drop a ball into them so they can witness the amazing acrobatics. Some run automatically. These sculptures have always been an attraction to me, but Perplexus is not one of them. These sculptures usually rely on the track being fixed, though they may also contain moving elements driven by the kinetic energy of the ball, such as swings, carriages, and levers. Very carefully designed systems are created so the ball cannot fall off the track unexpectedly. For a rolling ball sculpture this would be disastrous. The action relies on driving a ball to the top of the structure (storing potential energy) and allowing it to release this energy with downward momentum, until it reaches the bottom. They are for the most part observational and not interactive. On the other hand, Perplexus requires the track system itself to swing around continuously, orienting the local path to the plane of the earth. Tilting the current plane allows for movement. Potential and kinetic energy constantly switch throughout play, because the ball bearing moves from a high to a low and back to a high point at each plane and turn. Potential energy is stored at each plane change, and kinetic energy is released as each new plane is traversed. 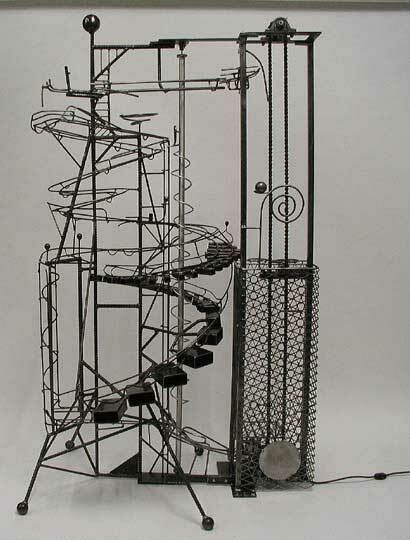 Mechanical elements introduced into a Perplexus rely on human set-up at the beginning of each step. A pivot or scoop will not function until proper orientation of the entire structure is achieved. And of course, to the bane of the participant, the ball often falls off unexpectedly! Perplexus is fully interactive. Human hands power all movement.